When entire Azure regions or datacenters (if no availability zones are used) experience downtime, it is critical for data processing to continue to operate in a different region or datacenter. As such, Geo-disaster recovery and Geo-replication are important features for any enterprise. Azure Event Hubs supports both geo-disaster recovery and geo-replication, at the namespace level. The Geo-disaster recovery feature is globally available for the Event Hubs Standard SKU. It's important to note the distinction between "outages" and "disasters." An outage is the temporary unavailability of Azure Event Hubs, and can affect some components of the service, such as a messaging store, or even the entire datacenter. However, after the problem is fixed, Event Hubs becomes available again. Typically, an outage does not cause the loss of messages or other data. An example of such an outage might be a power failure in the datacenter. Some outages are only short connection losses due to transient or network issues. A disaster is defined as the permanent, or longer-term loss of an Event Hubs cluster, Azure region, or datacenter. The region or datacenter may or may not become available again, or may be down for hours or days. Examples of such disasters are fire, flooding, or earthquake. A disaster that becomes permanent might cause the loss of some messages, events, or other data. However, in most cases there should be no data loss and messages can be recovered once the data center is back up. The Geo-disaster recovery feature of Azure Event Hubs is a disaster recovery solution. The concepts and workflow described in this article apply to disaster scenarios, and not to transient, or temporary outages. For a detailed discussion of disaster recovery in Microsoft Azure, see this article. The disaster recovery feature implements metadata disaster recovery, and relies on primary and secondary disaster recovery namespaces. Note that the Geo-disaster recovery feature is available for the Standard SKU only. You do not need to make any connection string changes, as the connection is made via an alias. Alias: The name for a disaster recovery configuration that you set up. The alias provides a single stable Fully Qualified Domain Name (FQDN) connection string. Applications use this alias connection string to connect to a namespace. Primary/secondary namespace: The namespaces that correspond to the alias. The primary namespace is "active" and receives messages (this can be an existing or new namespace). The secondary namespace is "passive" and does not receive messages. The metadata between both is in sync, so both can seamlessly accept messages without any application code or connection string changes. To ensure that only the active namespace receives messages, you must use the alias. Metadata: Entities such as event hubs and consumer groups; and their properties of the service that are associated with the namespace. Note that only entities and their settings are replicated automatically. Messages and events are not replicated. Failover: The process of activating the secondary namespace. The following section is an overview of the failover process, and explains how to set up the initial failover. You first create or use an existing primary namespace, and a new secondary namespace, then pair the two. This pairing gives you an alias that you can use to connect. Because you use an alias, you do not have to change connection strings. Only new namespaces can be added to your failover pairing. Finally, you should add some monitoring to detect if a failover is necessary. In most cases, the service is one part of a large ecosystem, thus automatic failovers are rarely possible, as very often failovers must be performed in sync with the remaining subsystem or infrastructure. In one example of this scenario, consider a Point of Sale (POS) solution that emits either messages or events. Event Hubs passes those events to some mapping or reformatting solution, which then forwards mapped data to another system for further processing. At that point, all of these systems might be hosted in the same Azure region. The decision on when and what part to fail over depends on the flow of data in your infrastructure. You can automate failover either with monitoring systems, or with custom-built monitoring solutions. However, such automation takes extra planning and work, which is out of the scope of this article. If another outage occurs, you want to be able to failover again. Therefore, set up another passive namespace and update the pairing. Pull messages from the former primary namespace once it is available again. After that, use that namespace for regular messaging outside of your geo-recovery setup, or delete the old primary namespace. Only fail forward semantics are supported. In this scenario, you fail over and then re-pair with a new namespace. Failing back is not supported; for example, in a SQL cluster. If you made a mistake; for example, you paired the wrong regions during the initial setup, you can break the pairing of the two namespaces at any time. If you want to use the paired namespaces as regular namespaces, delete the alias. Settings required in Azure Active Directory to use Azure Resource Manager with Event Hubs. Steps required to execute the sample code. Send and receive from the current primary namespace. In your failover planning, you should also consider the time factor. For example, if you lose connectivity for longer than 15 to 20 minutes, you might decide to initiate the failover. The fact that no data is replicated means that currently active sessions are not replicated. Additionally, duplicate detection and scheduled messages may not work. New sessions, scheduled messages, and new duplicates will work. Failing over a complex distributed infrastructure should be rehearsed at least once. Synchronizing entities can take some time, approximately 50-100 entities per minute. The Event Hubs Standard SKU supports Availability Zones, providing fault-isolated locations within an Azure region. The Availability Zones support for Azure Event Hubs Standard is only available in Azure regions where availability zones are present. 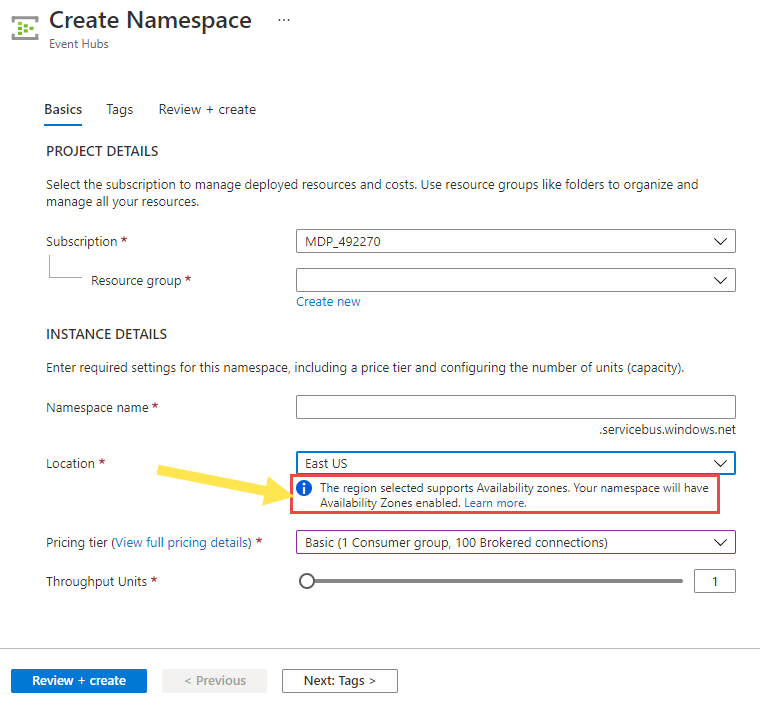 You can enable Availability Zones on new namespaces only, using the Azure portal. Event Hubs does not support migration of existing namespaces. You cannot disable zone redundancy after enabling it on your namespace. The sample on GitHub walks through a simple workflow that creates a geo-pairing and initiates a failover for a disaster recovery scenario. The REST API reference describes APIs for performing the Geo-disaster recovery configuration.